Come and join the Rhode Island College Women’s Soccer Summer Day Camp from the 6th of August until the 10th of August. It is open to all and any girls 7 to 15 years of age at any skill level. This soccer summer camp will be under the direction of the Rhode Island College Anchorwomen soccer coaching staff and current players. In addition, the event is going to take place at the scenic Rhode Island College campus. Its daily schedule is set to start at 8 o’clock in the morning until 4 o’clock in the afternoon. Furthermore, this camp emphasizes fundamental skills development through a fun trainig environment. All the instructions and groupings are in accordance with the attendee’s age and skill level. Rhode Island College, formerly Rhode Island College of Education, is a public, coeducational college in Providence, Rhode Island. As a whole, it has an accreditation from the New England Association of Schools and Colleges. Its departments have also accreditations from their own respective accrediting associations. Among these accreditations are from the National Council for Accreditation of Teacher Education, and the Commission on Collegiate Nursing Education. Currently, Rhode Island College is accommodating around 7,500 undergraduate students. 32 percent of this undergraduate student population are male students and 68 percent are female students. This undergraduate student population is also through a selective enrollment acceptance rate of 75 percent. Correspondingly, Rhode Island College’s student to faculty ratio is 14:1. Rhode Island College is also serving around 1,500 postgraduate students. The academic institution is using a semester-based academic calendar. Moreover, Rhode Island College fields 19 intercollegiate men’s and women’s sports teams competing in the Little East Conference (LEC) of the National Collegiate Athletic Association (NCAA) Division III. Their official colors are burgundy, gold, and white. They call themselves the Anchormen. The Rhode Island College baseball team is a two-time Conference Tournament Champion. The Rhode Island College baseball team also have an NCAA National tournament appearance in 1979. Christina Pirri, a native of Middletown, Connecticut is the head coach of the Rhode Island College women’s soccer team. She is now in her third year at the reins of the Anchorwomen’s soccer program. Coach Christina Pirri is a Rhode Island College graduate with the bachelor’s degree in graphic design and art history. In the 2016 season, Coach Pirri led the Anchorwomen to their first Little East Conference Tournament appearance. Additionally, Coach Christina Pirri is also a former college women’s soccer standout player. In fact, she is the 2008 team Most Valuable Player awardee. Coach Pirri was also a two-time Second Team All-Little East Conference selection. She is 11th in the Rhode Island College’s most goals scored in history. Then, the Rhode Island College women’s soccer assistant coach is Brian Sujecki, a native of Pawcatuck, Connecticut. Coach Brian Sujecki is in his first season with the Anchorwomen’s coaching staff. He is also a Rhode Island College graduate with a bachelor’s degree in community health and wellness. He is primarily working in the recruiting and scouting tasks. And finally, the Anchorwomen team captains are Brittany DeGrooth, Miranda Pacheco, and Stephanie Ricci. 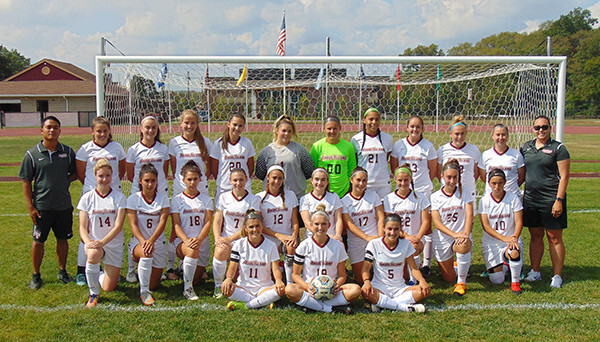 Join the Rhode Island College Women's Soccer Summer Day Camp. This summer camp aims at developing the player's overall fundamental through fun learning environment. It is open to all girls 7 to 15 years old at any skill level. This soccer camp will be under the direction of the Rhode Island College Anchorwomen coaching staff and current players.